Milk tea fanatics will surely love this treasure my husband and I discovered at 7-Eleven. Yes, 7-Eleven!!! Introducing, Mine Shine, a ready to drink milk tea beverage available at all 7-Eleven stores. At first we only found it at one of the branches in Makati, but it eventually became available in the 7-Eleven store near our home (hooray for that!). How does it taste? It tastes like the hokkaido milk tea at Serenitea. Far from the taste of Pokka's and Royal milk tea since it doesn't have a citrus tinge. Definitely something I'm storing in my ref. Thank you 7-Eleven! Yup, Clair and I have been fanatics for close to 2 years now. 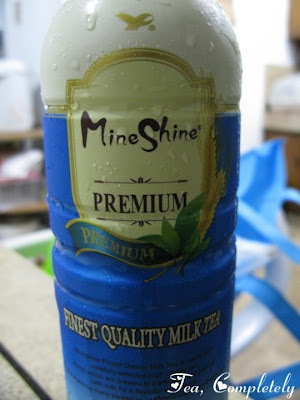 We discovered Mine Shine around 2008, but I have to agree -- it's been hard to find it in some 7-11 stores outside of Makati. Wow, how I wish this was available here in Davao! We don't have 7-11 here either! in fact, i'm drinking one now and i'v been hoarding since it usually runs out of stock. I've been drinking this for almost 10 years now! This is made of WIN. i must agree that this is great! i love this too :-) the chocolate milk tea is also yummy :-) plus i love the fact that it's only Php40! I tried one today cuz I've read so many people raving about it. Honestly, i was really disappointed by it. I found it really bland. Like it had been diluted A LOT. I wouldn't buy it again. i actually tried recently C2's Milk Tea and it was a lot tastier (though the only available size is really small).